Dexon (Dexamethasone) is a glucocorticoid drug. It suppresses the inflammatory response to a variety of agents. Used in various types of infectious inflammation of eye & ear. 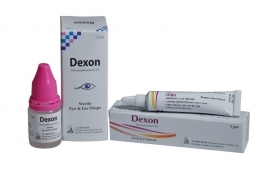 Dexon is available as 5 ml eye & ear drops and 3 gm sterile eye ointment. Dexon-G is a combination product of Gatifloxacin & Dexamethasone. Gatifloxacin inhibits bacterial DNA gyrase and Topoisomerase IV, the enzymes responsible for replication, transcription and repair of bacterial DNA. Dexamethasone suppresses the inflammation by decreasing the production of inflammatory mediators through the inhibition of the enzyme Phospholipase A2. 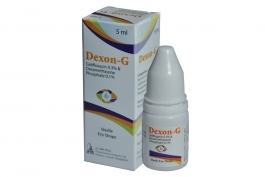 Dexon-G Sterile Eye Drops is indicated for steroid responsive ocular inflammatory conditions with involvement of bacteria like blepharitis, scleritis, episcleritis, iritis, cyclitis, iridocyclitis, choroiditis, optic neuritis and chronic anterior uveitis, disciform and interstitial keratitis, allergic corneal marginal ulcers, corneal injury from chemical radiation or thermal burns. Dexon-G is available as 5 ml sterile eye Drops.